The Navy’s uniform history stretches back centuries, covering everything from Revolutionary War-era garb to iconic World War II khakis to modern-day aquaflage. And don’t forget those dinner-dress tiaras. But while some of these seabag selections may have earned cultural prominence, one milestone isn’t as well known. According to one manufacturer and several history books, the modern-day T-shirt will turn 100 this year, after being first issued to sailors in 1913. T-Shirt Turns 100, a website run by CustomInk that’s celebrating this centennial, also states that the Navy was the first to issue the short-sleeved shirts with elastic necks to sailors. Other books and websites say the shirts were first worn by European or American soldiers during World War I, evolving from turn-of-the-1900s short-sleeved underwear tops. Either way, if the Navy wasn’t the first, it was definitely among the first. And to celebrate the T-shirt’s military heritage, CustomInk is selling T-shirts designed by a member of each military branch every month. 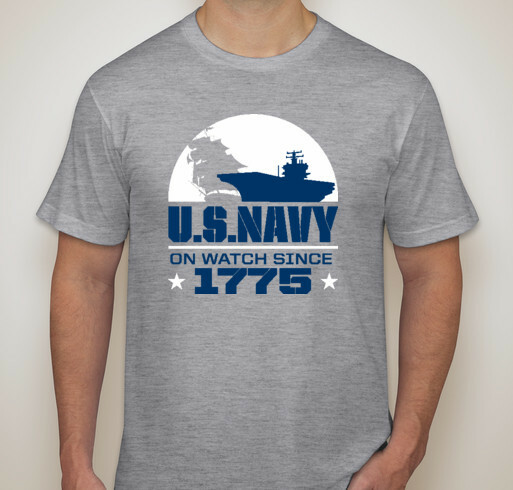 Because of its role in the T-shirt’s creation, Navy goes first. This shirt will be sold for the month of April, with all profits going to the Yellow Ribbon Fund, which supports veterans and their families at Walter Reed National Military Medical Center. Capt. (Dr.) David Tarantino designed the shirt, which says “U.S. Navy: On watch since 1775.” Tarantino received the Navy and Marine Corps Medal for his actions in the Pentagon on Sept. 11, 2001. When a hijacked plane hit the building, he rushed toward the smoke to help survivors and lifted a large piece of debris to allow a civilian employee to escape. I bought mine. The goal by April 31 is to sell 1000 T-shirts as of today only 171 has been sold. This is a great cause to support. CustomInk will donate 100% of our profit (at least $10 per shirt) to benefit the Yellow Ribbon Fund, which supports recovering veterans and their families at Walter Reed National Military Medical Center. In the late 1960’s the Uniform Regs went briefly to requiring v-neck t-shirts so that the white would not show under tropical khaki shirts. I went on wearing the regular shirts intending to replace them when they wore out. One day the XO called me aside and said that a senior officer from DC was coming and I should take my t-shirt off so the collar didn’t show. I did of course. Shortly thereafter the high collar shirts were reinstated and the rumor was that some Pentagon-level admiral’s wife thought that all that chest hair was undignified.